Access yearly lists of books most commonly recommended for kids, by kids. Lists of Young Adults' Choices and Teachers' Choices are also available. Not sure what to read next? Visit our blog to read about three different book-finding websites for great suggestions. Based on books you've enjoyed in the past, these sites will provide titles and descriptions of other great books that might be just up your alley! It can be tough to find lists of great books organized by grade, particularly when students get into middle and high school. TeachersFirst hosts a wonderful selection of grade-leveled lists of great reads sure to please any young reader from kindergarten up through 12th grade! Find out almost any book's grade, Lexile, and DRA level and search for books similar to books a student has enjoyed reading. An excellent resource. This website is a gold mine of book suggestions and reviews geared toward young adults. Users can sign up for the site’s monthly newsletter or browse hundreds of book reviews and author interviews. Teens may enjoy participating in polls or entering contests that could win them a selection of books, too. Visit this blog to get ideas for a kid-friendly craft that produces a set of memorable letters, both uppercase and lowercase. Once it's complete, hang the whole alphabet on the wall for easy reference. We love the way the shape of the letters are integrated into the shape of common objects to help kids build associations. Find templates to print this outstanding set of uppercase paper letters at home, then cut them out and glue them together using these instructions as a guide. Print on cardstock to improve durability. 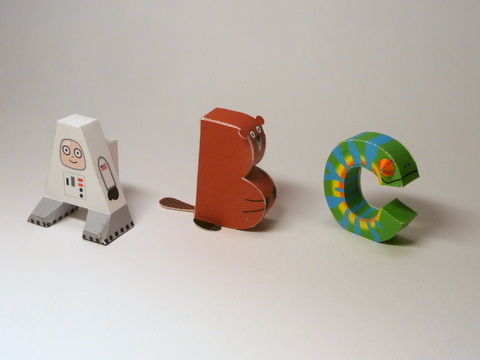 Like the project above (though requiring considerably more elbow grease), these clever letters will help your child remember the name, shape, and sound of the letters. Lexia's lauded software program provides kids with truly enriching reading experiences. Their research-based methods have been demonstrated to help students improve their decoding and comprehension skills. The system can be used at home or at school, and it's easy for parents and teachers to monitor student progress. Software created by reading experts at Lindamood-Bell to improve reading decoding and spelling. Developed by Orton-Gillingham, this software will help students improve their decoding and spelling skills. For more great reading games and apps, jump to our Games page. A great resource for non-fiction reading for kids in 4th through 6th grades. A huge range of topics are available, so there's sure to be someone for everyone here. Free access is available, but a paid subscription allows users to access more of the website. This innovative site allows users to access stories about current events and adjust the reading level simply by clicking a link. The language in most articles can be presented at a level as low as 3rd grade and as high as 12th grade. For younger children, Newsela Elementary hand-picks articles (also customizable) likely to be of interest to students in elementary school. Registration, which is required, is free. This children's version of the adult magazine has just as many wonderful photographs. There aren't as many articles to choose from as you'll find on Newsela or Time for Kids, but the ones they do post are excellent for 3rd through 5th graders. Perfect for sports-obsessed students, this magazine presents short, simpler articles about all kinds of sports. Both adult, professional athletes and young up-and-coming athletes are featured. Inkling allows students to practice active reading techniques (highlighting, making textual notes, etc.) and take quizzes using eBooks. This app allows users to highlight, make notes, and practice other active reading techniques. Students can also watch animations and take quizzes. Access a chart of comparing several programs, compiled by The Yellin Center. Created by the editors of SparkNotes, LitCharts provides great pre-reading tools in an innovative format. Many students find that previewing a novel with a condensed version improves their comprehension. LitCharts provides that preview, but instead of long summary paragraphs the information is presented in an interactive format with color-coded themes, sortable quotations, and more. Students can also find plot summaries and analyses of important characters, symbols, and quotations. LitCharts is available on Internet browsers or through their iPhone app. This free website allows users to plot any route on a dynamic map of the world. At each stopping point plotted, mappers can add a description and upload pictures of the locale, using either their own photos or pictures taken from the Internet. The presentation can be saved and shared as a slide show. Students can view maps and slideshows created by travelers to learn about the setting of a book, or create one based on a book they’ve read. Google’s Lit Trips is similar to Tripline, but it offers access to Google Earth’s impressive maps and satellite images, allowing for the creation of even more detailed journey maps. Students have the option of viewing a scene from above or of switching to a street-level view, which allows them to “look around” the scene by panning 360 degrees.